I took this pic a few days ago and I know almost nothing about astronomy and I was wondering what this bright object is on the right of the moon, it was in the SouthWest sky about 5:45 CST. And what would be the best way to remove the powerlines? I have PSP 7 and access to PhotoShop 7 but I really don't know how to use the tools in them them yet, just the simple stuff like resizing and cropping. At that time of the day, looks like it was Mars in the same frame. Best way to tell if it's a star or a planet, stars will actually shine with small fluctuation. Planets like Mars , Jupiter are much bigger, but they are more "tame"
Its been around the moon for a few months now. More likely Venus. Mars is high in the night sky now but Venus stays near the sun. You can see the reddish color in Mars as well. 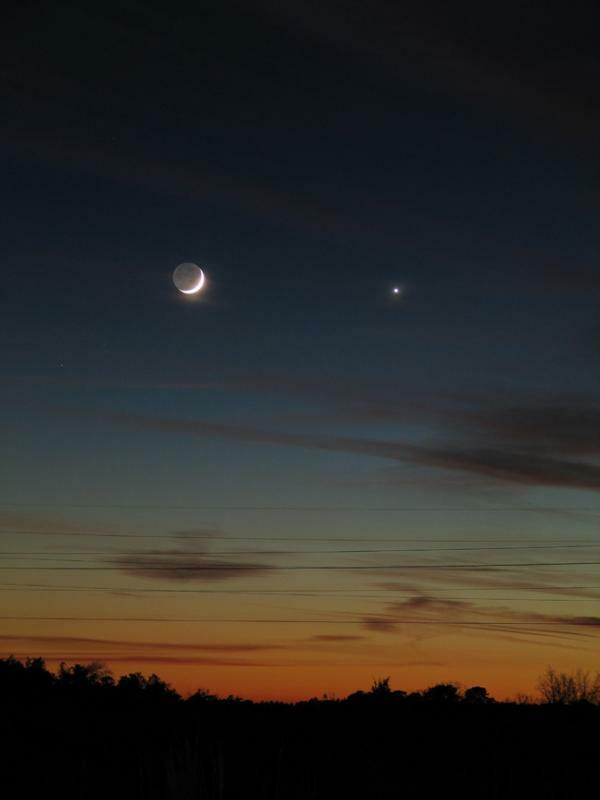 The moon falls back 50 minutes a day, so it is near different stars and planets every night. Using the clone stamp with a bush size of 13, I took a sky sample just under each wire and moved the stamp tool down the wire. I am NO expert and there are members on this forum who may have a better way. Cloning out wires in a sunset is usually easy. Most people want notice if you make a mistake. I am not real happy with one part of my cloning, but I must get ready for work. Comments on my cloning welcome.